Firefighters rescue trapped horse. Photo by West Sussex Fire and Rescue Service TRU. Firefighters undertook a four-hour rescue mission to help save a trapped horse. The animal fell into a cesspit along Charlwood Road, in Ifield, on Saturday afternoon (January 20). 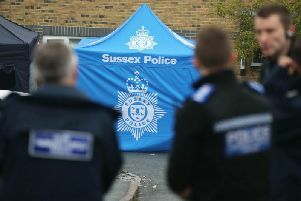 West Sussex Fire Service’s Technical Rescue Unit attended at about 1.50pm and were joined at the scene by vets and the police. The equine was sedated whilst crews used lifting equipment to pull it from the pit. It was rescued later that evening and the fire service said it was left in the care of the owner and vets. Police closed the road while the rescue took place and emergency services left the scene by 5.50pm. Firefighters rescue trapped horse. Photo by West Sussex Fire and Rescue Service.